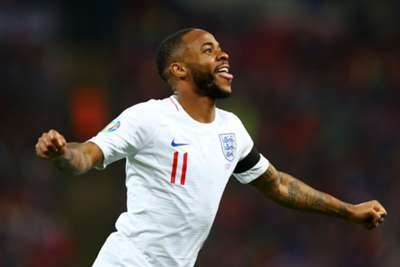 Gareth Southgate believes star forward Raheem Sterling has the qualities to captain England in the future. Sterling has established himself as a key man for the Three Lions and is enjoying a rich vein of form, netting a hat-trick against the Czech Republic on Friday after scoring twice in Spain late last year. The Manchester City talisman is also acting as a mentor for young prospects Jadon Sancho and Callum Hudson-Odoi, while he was widely praised for commenting on perceived racial discrimination earlier this season. England boss Southgate has seen enough to know that, should the side be without skipper Harry Kane, Sterling would be ready to step into a leadership role. "We've had three or four players captaining the team, and Raheem is developing lots of the qualities those guys have," Southgate told reporters ahead of Monday's meeting with Montenegro. "He has those qualities. It's difficult to talk about a potential captain when the captain [Kane] is in the hotel waiting to go out for dinner, but in terms of his personal qualities, he's shown some outstanding personal qualities." The Three Lions manager has already introduced Sterling to the team's senior leadership group, explaining: "In between November and March, observing his maturity and influence, I felt that would be a good step for him. "I think when you speak to other young players, he's one of the first they speak about making them feel really comfortable in the environment. That was a really important move for him."